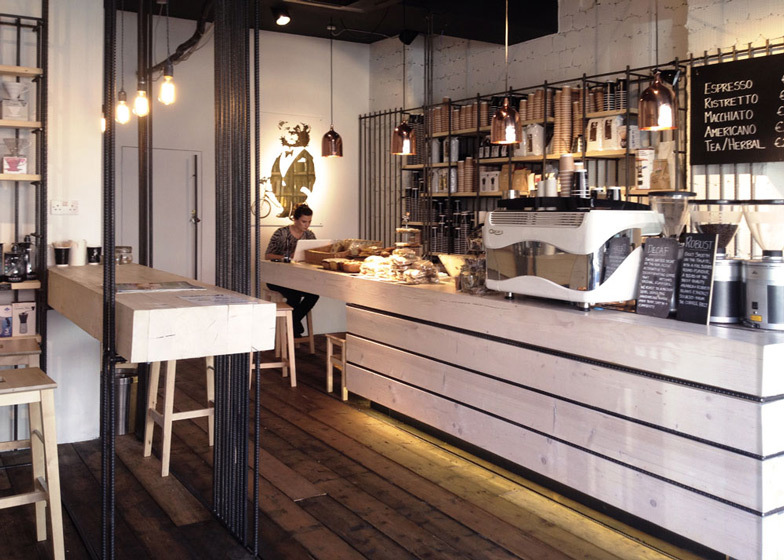 Steel reinforcing bars are used for shelving and partitions at this coffee shop in Dublin by VAV architects. VAV created storage spaces at the Bear Market Coffee shop from a series of vertical steel bars usually used to reinforce concrete in buildings. The bars also run from floor to ceiling in the centre of the space, holding up a chunky wooden table. "Our intent was to fill the space with vertical lines, and thus gently fragment the space, filtering the views and people within it," said the architects. "This forest of steel would, we hoped, create a brutal yet honest space." Sourced from a local steel manufacturer, the bars create gridded units that are built into the wall behind the coffee bar and have wooden planks inserted between them to display products. Bronze-coloured pendant lamps hang above the counter, which is made from stacks of oak sleepers. Thick wood planks have also been reused as table tops and the floor is made from recycled timber. The ceiling is left exposed and brick walls are painted white. The coffee shop is located on Main Street, Blackrock Village, County Dublin. Within tight budgetary constraints our objective was to fit various functions, café related, into a minimal preordained space, with limited construction alteration and modification possibilities. The concept for the design was to explore and question materiality, test the qualities of everyday materials and techniques available, while at the same time creating something unique and totally distinctive. The chosen material we selected for exploration purposes was reinforcement steel. Our intent was to fill the space with vertical lines, and thus gently fragment the space, filtering the views and people within it. This forest of steel would, we hoped, create a brutal yet honest space. The finished cafe would be perceived through the filtered vertical lines of the reinforcement bars, with shelving and benches hidden and supported within them. With steel dominating the interior, all other elements would simply act as a backdrop. Thus the original interior was stripped back to the core. Ceiling was totally exposed, walls were treated minimally, while existing tiles were roughly pulled off, leaving gridded screed surfaces. The floor was roughly laid with recycled timber, interlaid with steel rods, where the verticals connected with the ground. This timber flooring softened the space and hid the supports of the shelving units, with the reinforcement bars piercing through it to the hidden supports below. These two new elements - horizontal lines of timber and vertical of steel, intersected each other, griding the interior. Location: 19 Main Street, Blackrock, Co. Dublin. Architects: VAV architects: Darragh Breathnach, Pablo Bolinches Vidal, Daria Leikina.